The Group's environmental, social, and governance (ESG) performance is evaluated by various organisations, including rating agencies serving the research needs of the socially responsible investment (SRI) market. The Group is generally ranked above average (RobecoSAM), FTSE4GOOD and Euronext Vigeo Europe 120 and Euronext Vigeo France 20 (Vigeo Eiris). The following tables present an overview of the Group's main ESG ratings and scores. 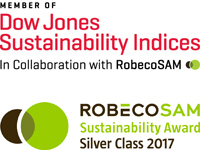 The Dow Jones Sustainability Indexes are compiled on the basis of wide-ranging surveys by Dow Jones Indexes in cooperation with SAM Group. 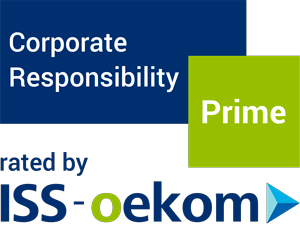 They are recognised worldwide as an important set of indexes for sustainable corporate governance and award the best in class in each category. The FTSE4Good Index Series has been designed to objectively measure the performance of companies that meet globally recognised corporate responsibility standards. Vigeo Eiris index component stocks are the companies rated highest for control of corporate responsibility risk and contribution to sustainable development. Performance is measured by the Equitics® method pioneered by Vigeo. ISS Environmental and Social QualityScore is a decile-based score that provides a measure of a company’s environmental and social practices as well as the quality of disclosure around these practices. A score of 1 places the company in the 1st decile of the industry, indicating relatively higher quality disclosure and transparency. AXA received a score of 1 for both the Environmental and Social dimensions. AXA rating C+ "Prime" C+ "Prime" C "Prime" C "Prime" C "Prime" C+ "Prime" C "Prime" C "Prime"
Social rating C+ C+ C "medium" C "medium" C "medium" C+ C "medium" C "medium"
Environmental rating C+ C+ C "medium" C+ C "medium" C+ C "medium" C "medium"
Sustainalytics is an award-winning global responsible investment research firm specialized in environmental, social and governance (ESG) research and analysis. In 2015, AXA ranks n°2 out of 150 insurance companies. The Carbon Disclosure Project is an alliance of large institutional investors who teamed up with the aim of making companies' greenhouse gas emissions and climate change strategies transparent for the financial market. Ipreo research has identified over 500 funds globally that are specifically dedicated to SRI investment strategies. Ipreo’s quarterly SRI Leaders Index gives a view across the companies most widely held by SRI investors, companies with the largest percentage of shares held by SRI funds, the largest SRI funds, and investment firms devoting significant capital to SRI funds. The AODP Global Climate Insurance Index rates and ranks the world’s largest insurance companies on their response to climate-related risks and opportunities and evaluate the level of integration of these risks and opportunities in investment and underwriting activities.